Dispose of antifreeze at a Household Hazardous Waste Facility in San Luis Obispo County. Antifreeze is highly toxic and can cause internal organ damage through skin absorption, so wearing gloves when handling it is highly recommended. Inhaling fumes can also cause dizziness. Never dump antifreeze into a sewer, storm drain, ditch, dry well, or septic system. This can cause serious water quality problems and might harm people, pets, or wildlife. Animals are attracted to antifreeze due to its sweet smell, but it’s highly poisonous. Licking or drinking even a small amount can kill an animal. So be sure that antifreeze is stored well away from animals and children, antifreeze spills are completely cleaned up, and leaks are immediately repaired. Conventional antifreeze lasts only two to three years. 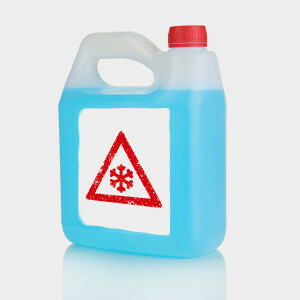 Buy it in small quantities to ensure that your antifreeze does not expire unused. Conventional antifreeze lasts only two to three years. But different chemicals in the antifreeze made with extended-life coolants allow it to last five years or 150,000 miles. Heavy-duty, extended-life antifreeze lasts between 400,000 and 600,000 miles with the use of a one-time extender. As many as 90,000 pets and wild animals are poisoned annually by drinking spilled or carelessly stored products containing ethylene glycol, such as antifreeze. Manufacturers are starting to add bittering agents to deter animals, but there is still plenty of antifreeze out there that is sweet and attractive to animals.